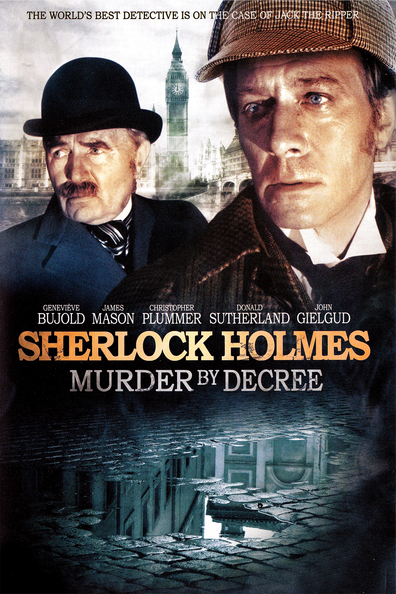 Chrichton's World: Review Murder by Decree (1979): Totally misses the mark! Review Murder by Decree (1979): Totally misses the mark! This film might fool you most of the time but long before it's conclusion you will feel duped. I don't know what they were going for but as Sherlock Holmes films go this is quite off. Sure there were some interesting dynamics between Sherlock (Christopher Plummer) and Watson (James Mason) but other than that the mystique surrounding Sherlock Holmes was non existent. There is nothing remarkable about this consulting detective as he stumbles from one event to another. At times I thought to myself I was watching the comedy Without a Clue or The Adventure of Sherlock Holmes' Smarter Brother. The mystery itself was handled pretty solid as it keeps you in the dark until it becomes painfully obvious of what is going on. Instead of then offering us a twist or two it gives us a reveal that by then is predictable and disappointing. Then what was the point of having Sherlock in this story? They could have given us any inquisitive creature and given it the same conclusion. It would have made no difference. The brilliance of Sherlock Holmes as a character is the fact that he sees things "normal" people are overlooking. Here he is so far behind that it becomes laughable. And seriously Holmes crying and being sad over the horrors committed by man? This guy who has witnessed far worse would almost break down? Please. That's just isn't right. One thing I have to give this production is the way it looks visually. The atmosphere was right and especially some scenes looked haunting even today. Too bad though that the story itself was poorly done. You would think that with Jack The Ripper featured as killer you would be on the edge of your seat. But I will have to disappoint you since it is most likely you will fall asleep since the film is plagued with incredible boredom. Very little is going on and even with all the good will I had the story never really becomes compelling. Even if you would disregard the Sherlock Holmes element and just treat it as a whodunnit it fails miserably since the reveal is so cliché and ordinary. I really want to be more positive about this film but I simply can't. Set aside that this Sherlock Holmes is not the one of the books or the series with Jeremy Brett. It was lacking too much the things I like in mystery films. The wonderful acting by Christopher Plummer and James Mason is not enough to make me overlook it's flaws.